BOONE – With a chance to clinch the Sun Belt East Division and host the inaugural Sun Belt Conference championship game, Appalachian State and Troy came into Saturday's gridiron clash with everything to gain. In a game that featured the two top defenses in the Sun Belt Conference, it was Appalachian State who came away victorious after a 21-10 win and the Mountaineers will host either Arkansas State, UL-Monroe, or Louisiana next week. Turnovers determined the winner of the game as App State was able to score fourteen of its twenty-one points off of four Troy turnovers. Zac Thomas found Corey Sutton for two of App State's touchdowns. Thomas scored the other touchdown on a quarterback keeper. Sutton led ASU's receivers with five grabs for seventy-two yards. 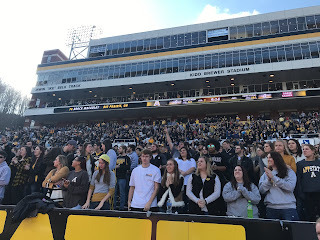 Although Appalachian State scored two of their three touchdowns through the air, it was the ground game that kept the Mountaineers in the game and the Troy offense on the sideline. Led by Darrynton Evans, who recorded his fifth 100-yard game in Sun Belt competition, App State rushed forty-five times for 201 yards. The App State defense held Troy to 232 total yards, well under the four-hundred the Trojans had been averaging so far this season and the second fewest Troy amassed in a game during the 2018 season. The Mountaineer defense was able to hold potent Troy running back in BJ Smith to only fifty-three yards and forced the Trojans to try and win through the air, a game plan that greatly favored the home team. Leading the App State defense was former Thomasville Bulldog Akeem Davis-Gaither who finished the game with fourteen tackles (four solo) and a pass breakup. Clifton Duck also added an interception, the twelfth of his career and the twelfth of the season for the famed "Legion of Boone" defensive backfield. Appalachian State will take on either Louisiana, U-Monroe, or Arkansas State next week. Game time is scheduled for noon.